Herbs, perennial, sometimes slightly woody at base; taproot long, ropelike, ± woody. Stems usually erect or ascending, occasionally decumbent, sparingly branched throughout, 2-5(-9) dm, hirsute, puberulent, or glandular basally, hair types often mixed, glandular-puberulent, glabrous, or occasionally puberulent and sparsely hispid distally. Leaves mostly in basal 2/3 of plant; larger leaves with petiole 1-5 mm, blade lanceolate to linear, rarely ovate, 15-35 × 1-15 mm (distal leaves usually longer, narrower), adaxial surface glabrous or sparsely hispid, occasionally glandular-pubescent, sometimes punctate, abaxial surface usually paler than adaxial, glabrous or sparsely hispid, occasionally glandular-pubescent, usually punctate with small patches of large gray to dark brown cells, base obtuse, truncate, or rounded, margins entire and revolute, apex usually acute, sometimes obtuse or rounded. Inflorescences terminal and axillary, forked ca. 2-4 times unequally, open, without sticky internodal bands; branches strongly ascending, terminating in loose, 1-few-flowered, cymose clusters. Flowers: pedicel 1-2(-5) mm; bracts at base of perianth persistent, 3, lanceolate to ovate-acuminate, 1-2 mm; perianth purplish pink, widely funnelform beyond constriction, 4-7 mm; stamens 5(-6), well exserted. Fruits borne singly (or 2-3 in open clusters), dark gray-brown, oblong-clavate, 2.5-3.5 × 1.2-1.5 mm (l/w: (1.7-)2.1-3.5), apex round, usually glabrous; ribs (4-)5, broadly rounded, smooth, edges sharp and slightly overhanging sulcus; sulci about as wide as base of ribs, smooth, not papillate (very rarely minutely and sparsely puberulent). 2n = ca. 52. Flowering mid spring-late summer. Open, calcareous soils or rock in arid grasslands or shrublands; 400-1700 m; N.Mex., Tex. ; Mexico (Chihuahua, Coahuila). 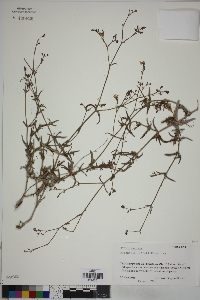 Boerhavia linearifolia has been reported from Alabama, but no documenting specimen has been seen.